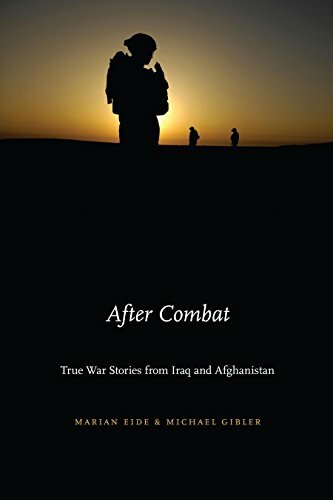 After Combat: True War Stories from Iraq and Afghanistan. Marian Eide and Michael Gibler. Lincoln. NE: Potomac Books, 2018. As the United States approaches the end of another decade of combat, strife, and uncertainty in its global affairs, two conflicted regions loom large. The American presence in Iraq and Afghanistan drags onward, and, as the American population and government discuss withdrawal, the narrative of the last twenty years begins to come into view. The experiences of American soldiers deployed to these regions, sometimes over and over again, are central to this story, including consideration of the lasting impact of their time abroad. American culture is already rife with conversations about post-traumatic stress, veterans’ services, and treatments following deployments. Unfortunately, the voice of the veterans themselves is seldom heard with clarity in these conversations. Marian Eide and Michael Gibler attempt to provide that voice and stage in After Combat, a series of anecdotes, stories, and lessons from nearly twenty years of soldiers’ experiences. Working with a group of more than thirty veterans in total, whose experiences span the length of American involvement in both Afghanistan and Iraq, the authors approach the very important and yet sometimes uncomfortable question in asking soldiers: “How was your war?” Seeking the unfiltered and unvarnished war experiences of ordinary soldiers is often difficult for academics and other outside chroniclers, which is why the pairing of Eide and Gibler works so well. Marian Eide is a self-proclaimed pacifist academic. Gibler is a veteran of Iraq, Afghanistan, and several other deployments. The authors come together to create both an objective and experienced space for veterans to share their stories and experiences. After Combat offers an interesting and different approach to the oral history project, focusing on the unaltered, unabridged, and—most importantly—unfiltered experiences of American soldiers in these conflicts. Speaking anonymously with Gibler and Eide, the soldiers of this project do not offer a clear narrative of their individual experiences; instead, they come together to build a collective sense of narration. The chapters here are organized thematically, with titles like “Enlistment/Commission,” “In Country,” “Nostalgia,” “Loss,” and the frequently heard “Thank you for your service.” Each anonymous anecdote is separated by a simple series of dots, and the reader is repeatedly thrown into a totally different and unique experience. This approach works well, as each topic is examined and presented from a number of different and anonymous sources in sequence. It provides the reader the full gambit of experiences, motivations, and consequences without cluttering the conversation with names, qualifications, and interpretations. Perhaps the most poignant area of the book are the sections on “Loss,” “Nostalgia,” and “Struggling.” These topics highlight the strength of the anonymous approach, as the soldiers’ testimonies are brutally honest and gut-wrenching. The connection of these issues is apparent and revealing, as these soldiers discuss a longing for the simplicity of military life while relating the pain of loss and the debilitating impacts of post-traumatic stress and other traumas suffered while on deployments. One soldier admits to pining for the “black and white of it all…” in his service and laments his inability to find purpose in civilian life. What these sections demonstrate, along with all the chapters, is the soldiers’ unique desire for and experience of camaraderie. The vast majority of the anecdotes in these sensitive sections reference the importance of their fellow soldiers and their shared experience. This, above all else, comes off the page like the one irreplaceable element of their deployments...and one of the many pieces of warfare non-veterans may never truly understand. The sections chosen by Eide and Gibler admirably work to bridge this gap. The voices here are visceral and often uncomfortably honest, which adds to the powerful insight of this project. Whether it is the casual reference to “picking up body parts” or the powerful understanding that “[t]here’s a lot of people out there like me who are quiet and suffering”, the structure of this work provides something new and ultimately very eye-opening to its readers. What Eide and Gibler’s book fails to accomplish is rather obvious, as their voices have neither face nor setting. Are the soldiers more at peace with their actions from a different period of the war? What larger understandings are lost through the anonymous nature of the project? While you gain some perspective into a soldier’s experience, the work lacks the necessary exposition to firmly place that experience in the larger corpus of the conflict. Regardless, this book is ultimately useful in guiding and creating dialogue and questions about American soldiers’ experiences in Iraq and Afghanistan, even if it offers little hard argument about the conflicts themselves. In the end, one is left with a greater understanding of how these conflicts impacted the men and women involved. It feels as if these anonymous individuals are talking to their close friends and compatriots, as they honestly appraise their experiences. After Combat is a different kind of page-turner, one that you can read a few pages and put back down rather quickly. It evokes a series of important and somewhat uncomfortable emotions, exactly its objective, as it pushes the unfiltered experience of war to a mass audience. James Sandy is an Assistant Professor of Instruction at the University of Texas at Arlington, where he teaches military and cultural history courses spanning a wide arc of topics. His research focuses on the Vietnam War, American martial culture, the nexus of irregular and conventional warfare, and warfare centered comic books. p. 28. and p. 234.